In Italy, gelato is about so much more than just taste. Italian gelaterias are often esteemed local businesses; in fact, more than 55% of the market share of gelato in Italy is handmade. American business owners may wonder how such an old industry can still have such a strong hold on the market. Grab your gelato spoons to get a bite of the unique ways gelato is made, presented, and eaten in Italy. The temperature and texture of gelato sets it apart from other frozen treats. Gelato is served at a slightly warmer temperature than ice cream, allowing it to contain less air and fat without melting and separating. This is what keeps gelato seemingly colder and more refreshing longer than ice cream, especially on hot days. American ice cream is also often harder at its serving temperature which requires spoons and scoops that are able to cut through despite resistance. In this sense, the closer American cousin to gelato is frozen yogurt. Frozen yogurt spoons are more appropriate for an American gelateria because they are designed for smoother consistency desserts and usually have soft, rounded edges that allow texture and flavor to take the stage. Long bars gleam with pan after pan of gelato, often in surprisingly warm and natural colors because true Italian gelato does not use artificial food coloring. Instead of coloring the gelato itself, Italian gelato makers pile fresh examples of each flavor’s primary ingredient atop the half of the pan of gelato toward the customer’s side of the case. The fruits used are often purchased fresh at the crack of dawn at local farmers markets. Customers point eagerly to flavors they’d like to try, which are provided on tiny flat taster spoons to give the perfect hint at the joys a full order of gelato will bring them. Even the way gelato is served has been only partially imported to America. When visiting an authentic Italian gelateria you will often find brightly colored menus showcasing spreads of elaborate “coppe”. Coppe are best explained as the distant and elaborate Italian relative of the ice cream sundae. Decked out with a variety of flavors, biscuits, toppings, and other decorations, coppe are eaten with long-necked gelato spoons that allow the user to sample flavors all the way at the bottom of the cup without having to eat the rest first. 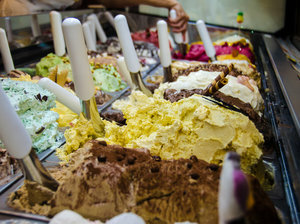 Gelato has a rich culture beyond simply being a tasty high-quality dessert. American gelato vendors with a true appreciation for gelato should look to their fellow dessert-makers across the sea for more than just recipes. Gelato Products is a frozen desserts supplies retailer based out of Los Angeles, California. Check out their wide range of products, such as taster spoons and gelato bowls, at gelatoproducts.com.